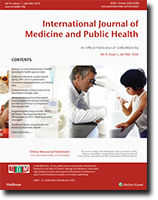 A. NS, “Assessing Coverage of Mass Drug Administration against Lymphatic Filariasis in Gulbarga District, Karnataka”, International Journal of Medicine and Public Health, vol. 2, no. 3, pp. 25-28, 2012. O. Harsh Nikhilkumar and Bakulesh, D. Ruchir, “Primary Hyperaldosteronism Presenting as Hypokalemic Paralysis”, International Journal of Medicine and Public Health, vol. 9, no. 1, pp. 31-33, 2019. B. Valantina Neelakandan, Gopalakrishnan, S. , Ramachandran, H. , R, A. , and Gopichandran, V. , “Health Beliefs Regarding Uptake of Hypertension Screening in an Urban Setting: A Population Segmentation Strategy”, International Journal of Medicine and Public Health, vol. 8, no. 1, pp. 11-17, 2018. T. NDAYISENGA, “Maternal and Newborn Risk Factors associated With Neonatal Mortality in Gitwe District Hospital in Ruhango District, Rwanda”, International Journal of Medicine and Public Health, vol. 6, no. 2, pp. 98-102, 2016. R. Nayak, D’souza, B. , Kotrashetti, V. S. , and Somannavar, P. , “Correlation and comparison of body mass index and oral health status among urban South Indian population: A pilot study”, International Journal of Medicine and Public Health, vol. 5, no. 2, pp. 184-188, 2015. A. Nath, “India’s vision for health: Perspectives from the XIIth five-year plan (2012-2017)”, International Journal of Medicine and Public Health, vol. 4, no. 1, pp. 46-50, 2014. B. Naruboina, Praveen, K. , and Rashmi, N. , “Prevalence and Factors Influencing Depression among Adolescents with Type-1 Diabetes – A Cross-Sectional Study.”, International Journal of Medicine and Public Health, vol. 7, no. 3, p. 165, 2017. D. Narayanappa, Rajani, H. Sreenivasa, Anilkumar, M. Ganeshrao, and Mamatha, S. , “Massive hemoptysis in a child: An unusual presentation of hydatid cyst”, International Journal of Medicine and Public Health, vol. 4, no. 3, pp. 304-306, 2014. V. Narayan, Chokshi, M. , and Hasan, H. , “A comparative review of the list of essential medicines of three Indian states: Findings and implications”, International Journal of Medicine and Public Health, vol. 5, no. 1, pp. 71-76, 2015. M. L. Nanang and Atabila, A. , “Factors predicting home delivery among women in Bosomtwe-Atwima-Kwanwoma district of Ghana: A case control study”, International Journal of Medicine and Public Health, vol. 4, no. 3, pp. 287-291, 2014. N. Nalina, Chandra, M. R. Sathish, and , , “Assessment of quality of life in bronchial asthma patients”, International Journal of Medicine and Public Health, vol. 5, no. 1, pp. 93-97, 2015. S. Nair, Abraham, A. , Ramachandran, R. , Mohan, D. , and V, R. Kutty, “Pattern and determinants of respiratory mortality in Kerala, South India”, International Journal of Medicine and Public Health, vol. 4, no. 4, pp. 467-471, 2014. B. T. Nair, Sanjeev, R. Krishna, and Mishra, A. , “Dengue epidemic management in a developing country”, International Journal of Medicine and Public Health, vol. 5, no. 3, pp. 213-216, 2015. S. Pallipurat Nair, Nair, A. Thekkumkar, Varaghese, S. , Krishnapillai, V. , Thomas, A. , and Mendez, A. Metilda, “Morbidity Profile and Quality of Life (QOL) of the Beneficiaries of Asraya Project: A Study from Kerala”, International Journal of Medicine and Public Health, vol. 7, no. 3, pp. 142-146, 2017. V. Nagarajarao, Ahmed, M. , Ravi, A. , Pattabhirama, G. Holenarasi, and Balasundaram, K. , “A study of early neonatal morbidity profile in a district teaching hospital, Mysore, India”, International Journal of Medicine and Public Health, vol. 4, no. 4, pp. 396-399, 2014. T. Nag and Ghosh, A. , “Prevalence of cardiovascular disease risk factors in a rural community in West Bengal, India”, International Journal of Medicine and Public Health, vol. 5, no. 4, pp. 259-264, 2015. A. M. Nadya, Inne, S. S. , and Yetty, N. , “Description of the difference in plaque index between normal and autistic children age 6-12 years”, International Journal of Medicine and Public Health, vol. 3, no. 3, pp. 197-199, 2013. H. Kumar H. N, P, S. Upadhya, P, S. Ashok, G, A. Chowdari, G.M, N. , and B, D. , “A cross-sectional study on awareness and perception about basic life support/ cardio-pulmonary resuscitation among undergraduate medical students from coastal South India”, International Journal of Medicine and Public Health, vol. 3, no. 3, pp. 146-150, 2013.